You are here: Home � All Deals , Electronics: Computers Video Games GPS , Featured � Buy an ipod touch and get a complimentary $30 gift card with purchase. 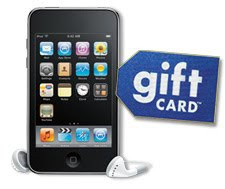 Buy an ipod touch and get a complimentary $30 gift card with purchase. Best Buy is offering a free $30 Gift Card with Any iPod touch purchase. This offer is available on the 8gb, 32gb, and 64gb models and valid between 12/13 to 12/19 . If you decide to pull the trigger on this offer you can also receive an instant $20 discount on a XM skydock with purchase.